I really like Economy but all are sew sweet, great job! I like Economy too because of the secondary design it makes. Cute block! P B and J for me too. Love the colours and the simplicity of it! I would use scrappy economy way. I like the Economy layout, but I'm crazy about PB&J--perhaps the Economy quilt in PB&J? I love Economy layout best! Oh, I prefer the Economy layout - just such possibility! The Economy layout is my favorite, too! I like the snowball the most. I like the original with snowball blocks. Thanks for the giveaway! I love your block paired with the economy block. Thanks for the chance to win. I think I like the setting with the Economy Block! I like the Economy setting. I might have been influenced by the fact that I love the colors and fabrics in that one! My first choice would be Economy, but love all of them! My favorite is the Economy version, but I like them all. Thanks for the chance to win! I like the economy the best. Thanks for the chance to win a copy of the magazine. I'm with most of the others - I like the economy one the best. Thank you for the chance to win a copy of the magazine. I like PB & J also. I think I like economy best but all are cute. Economy is the one I like the best..but the others are great too! I like the Economy layout the best. Great block! I love the PB&J versions - stellar! They are all great, but I am leaning to Economy. Thanks for sharing.. I love the secondary pattern that Ecomony makes. Cool Block! I like them all! LOL! It's the Economy for me. I love the Economy layout, it's so pretty. Thanks. The block is great and my favorite setting is the economy block. I like it set with the economy block very much! Economy has my vote. Thanks for a chance to participate. PB & J, easy pick. It was fun! I like the snowball blocks. But it's probably the colors that make me like it! Hope I win! SNOWBALL! But the others are great, too. I like the snowball layout best. Thanks for the chance to win. Snowball. It sets the block off very nicely. I really like Snowball - great designs! I 'm draw to PB & J also. Great block! Snowball! Congrats on getting your block in the magazine! Love your block! Hi! Thanks. I like the snowball design best. The Economy layout is my favorite for all of the different colors used. Looks great. I like the snowball and that color scheme the best. I like the snowball quilt best. You block makes me think of candy wraped up for Christmas and I think it would look great in holiday colors. PB&J is my clear favorite. I really like your X-Act Block and since I am in love with Kate Spain's Honey Honey fabric, I am choosing Economic Block. This is going to make an awesome quilt. Thank you for taking the time out to join us in the Quiltmaker's 100 Blocks, Volume 6 blog tour and giving all of your followers a chance to win a copy. love the layout economy with Kate Spain's Haoney honey fabrics....Beautiful. I love the setting in the snowball block! Really shows off the block!! Your block is a totally different block, and I just love that!! Can't wait to get my hands on Volume 6! I am excited, too!! Oooh...this is a tough choice. I love the houndstooth in Snowball ... but I love the blues in Economy! I think I'll stick with the Economy setting though -- fun!! I like the Economy block the best. 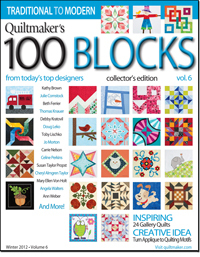 Congratulations for having your block published in Quiltmakers 100 Blocks and thanks for the chance to win a copy of it! I would love to win copy! Thanks for chance. That is a great block and like everyone else, I like the scrappy economy block best. Great job. I love the snowball design best. Very nice block, Vickie! I like all the designs, but Economy is the most eye catching, IMO. Congrats on having a block in this issue! I like the Economy quilt the best. Thanks for a chance to win. I like the Economy block layout best. I like all of them, but I have to say Economy is my favorite of the three. I'm imaging the block in even more settings - the sky is the limit! I like the P B & J block the best, but the others are nice, too. I especially like the "movement" your block has --- lots of possibilities. I like Economy because of the secondary designs. Thanks for cuteness and a chance to win! The P B and J version does it for me. 2nd would be the original. I have to say Economy. I'd like to see it with even more 'hidden' colors, almost like some of those patterns that fool the eye into thinking it's 3-D, or you don't see certain shapes unless you turn it 'this way' -- something like that. Lovely work. I like the Economy version--fun block! I love the Economy block the best. It looks like it might be more work but as a quilter I like a challenge. I really like it with the basic grey, nice contrast with that one. to choose it would be the economy. I love the snowball version! I like economy the best, There is so much interest in the pieced blocks. I am a fan of on point also so that one is my favorite. I like the look of the Economy setting with scrappy X-act blocks, but I like the Snowball layout when using coordinated fabrics. I'm afraid that I'm not a fan of the straight set because I think it needs more of the X-act blocks. Lovely block, I like it paired with the snowball block. Love to win. My favorite layout is with the economy block. Great secondary designs! I love how versatile your block is. I flat love the Ecomomy design. I love how it looks like it is all twisted and and how it just pops. Beautiful. Great block! I think I like the Economy setting best. But then, I'm a sucker for lots of piecing. Thanks for the chance! I like the Snowball layout best! I think I like the Economy pattern best. It really is a great block. thanks for the chance to win a copy. I like the economy setting. They are all good settings though and I'm sure your block would work up some more to! I like the economy layout. I think I'll vote for Economy. Thanks for the chance to win a copy of the magazine. I really like the Economy version. I like Snowball. Thanks for the giveaway! I like the snowball version. I like your block, really different. I like the Economy layout best. Congrats on your entry into the book. I want to WIN! I like the P B & J version the best. Thank you for your block. Fabulous block - congrats! I would be a snowball girl for sure! thanks! I like economy! Such fun and I love your block! All the layouts are so different that it is hard to pick. I will pick the economy layout. Well I think I like the first setting the best but like the colors of the economy layout best. Very versitile block! Thanks for the chance! I really like the snowball block, maybe it's because of the fabric used in the snowball! I like the snowball layout the best. I like the economy setting. Economy. Love the visual effect. Interesting to see the three options and how different each is. The straight set with PB & J is my favorite! Sweet block! I vote for Economy (: It brings a sparkle to the quilt. I love the snowball. Thanks for sharing. My eye is drawn more to the snowball version. I love the Snowball layout! Thanks so much for a chance at the give-away! Fun block! It lends itself to lots of variation. I love your version with the economy block. The blocks play together very well! I like your Economy layout the best. I like the snowball setting best. I think my favorite is PB & J.
I like P B and J, for the pinwheels stand out and look like they are dancing! Nice block! I like the snowball version. I like the Economy block setting. Thanks! I like them all but I think the Economy block is my fav! Congratulations on getting your block published in the magazine. The Economy version is my favorite. I agree the Economy Block is the one I like best. I like the Economy block, never heard of it, but I like it! I like the first layout. I think I like Snowball best. Cute block! I like the P B and J best! Congratulations Vickie. You've created a very pretty block. I really do like the Economy version best. Love the P B and J version. It is simple and striking! Very pretty colors. Thanks for the opportunity to win! I like the layout of the Economy setting but I like the fabrics in the first one! I prefer the economy setting. Thanks for the chance to win. I like the pb and j one, too!! That caught my eye right off the bat! I am so glad you are in the magazine...I love following your blog!!! The block is terrific. I like the snowball layout best because it gives plenty of room for fancy quilting. I like the Snowball version. Thanks for the chance to win a copy of the magazine. Economy! Thanks for the chance. Your block is awesome and makes beautiful quilts. All three versions are great but I think I like Economy just a smidhe over PB&J. I like the Economy setting the best. The PB & J is a very close second, though! Great block. Congratulations on being included! Oh, I love the Economy block. P B and J gets my vote. Striking! I like the PB and J - looks very modern. swalker287 (at) gmail (dot) com. My favorite is the Snowball version, but the fact I love red had something to do with it. They are all awesome. I love it set straight! I like them all because each looks so different but my favorite would be Snowball. I love the economy block with Kate Spain fabric, each block looks so different with a change of color. I prefer the Economy version. I don't know if it's because of the increased detail, or whether I just like those colors better. I like the Economy layout the best. I like it with the Economy blok but love Vintage Modern too. I like them all, but, I think 'Economy' is the best. I luv the colors in it too. Congrats on being included in the issue! Love the fabrics in your block. I think my favorite layout is the Economy. thanks for the chance to win! I like the one with the economy block-makes yours look like an "old" traditional block! Keep up the good work! Love Economy! I'd like to do it in colors like those you used in Snowball! My favorite is Economy. Really love the colors too. My favorite is the Economy version. Great job! I love the ecomony version. I love lots of pieces. I know that is weird. But I love how little pieces can come together and make a beautiful quilt. Love the Basic Grey version. I really like the Economy layout the best. It is a cute block. Congrats on being chosen to be in the magazine. I really like the economy, but all of the quilts are lovely. It is amazing how different the same block can look by just changing the arrangements. Good job. this layout just made me smile. thanks!! I prefer the setting with the Economy blocks! It looks great. Of course they are ALL nice! Thanks for the chance to win! Lovely block! Nice that there is more than one option for a layout. I like the PB&J, kind of modern looking. Economy is a close second. Thanks for sharing and for your giveaway. Like the economy layout the best, and it's scrappier look Thanks for sharing. I saw the first two quilts and thought I wonder what they would look like together. and voila, there they were together and I loved it.